Just a quick update on new work, new ventures, and new events. I am on a (mostly) sabbatical for the 2014-2015 academic year, with a full release from my teaching responsibilities. I will still continue to helm our Center for Teaching Excellence, but otherwise will focus on my writing projects. In addition to continuing my regular monthly column for the Chronicle of Higher Education, I have two book projects in the works. The first is a book on teaching and learning that focuses on small interventions we can make in any type of teaching environment in order to maximize student learning. These interventions are based on the research in learning theory I have been doing for the past several years, and are designed to stretch across teaching formats and institution types. For a preview of this approach, you can see my recent essay in Faculty Focus on the learning activities of predicting and retrieving. The book is scheduled for completion in spring of 2015, with an expected publication date of early 2016. I am also working on a book project in my home discipline of British literature. I am still tightening up my sense of the audience and focus of this book, but essentially it will analyze the nonfiction writings of George Orwell on poverty, explore how those early writings shaped his later (much more famous) fiction, and consider the relevance of his insights into poverty to the 21st century global economy. I've begun publishing bits and pieces of my journey with Orwell in various places, including the Chronicle of Higher Education, America Magazine, Notre Dame Magazine, and even over at Bill and Dave's Cocktail Hour. The 2013-2014 academic year has been my busiest year by far in terms of opportunities to travel and speak to faculty, graduate students, and students on other campuses. Much of that has been driven by Cheating Lessons, as institutions at every level seek to instill academic integrity among their students. Last year included visits to the American University of Armenia, Ohio State, North Carolina State, Lamar University, Columbus State Community College, and more. I was also privileged to deliver keynotes at several conferences, including the annual conference of the International Center for Academic Integrity. Fall of 2014 is shaping up to be equally busy, with currently scheduled visits including Georgia Tech, Bucknell, Rice, Indiana State, and Notre Dame. Most exciting for me, though, has been the opportunity to speak and work with faculty at international institutions. In addition to leading a service trip for Assumption College students to Ecuador in January, I will be paying visits to institutions in Canada, Jordan, Columbia, and Scotland. I count international travel as one of the greatest joys in my life--so this promises to be a joyful year! Life at home continues apace. The eldest will be entering her sophomore year of college, while the twins down at the end of the batting order will be entering fifth grade. 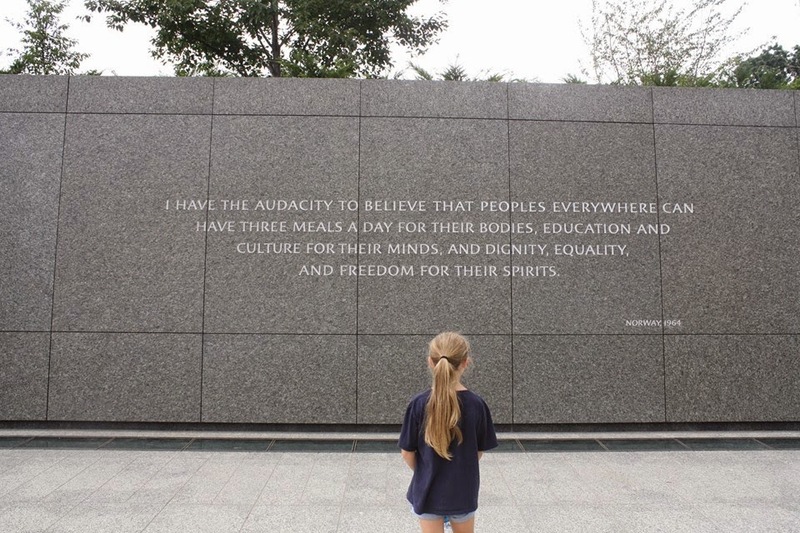 On our visit to Washington DC this year I managed to catch a nice unscripted moment with the girl getting some inspiration at the Martin Luther King, Jr. memorial. Enjoy these final weeks of summer.